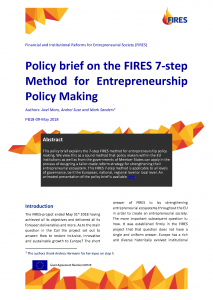 This policy brief explains the 7-step FIRES method for entrepreneurship policy making. 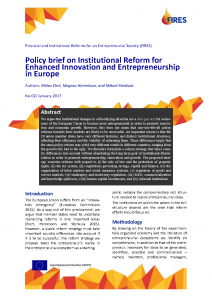 We view this as a sound method that policy makers within the EU institutions as well as from the governments of Member States can apply in the process of designing a tailor-made reform strategy for strengthening their entrepreneurial ecosystem. This FIRES 7-step method is applicable to all levels of governance, be it the European, national, regional level or local level. An animated presentation of the policy brief is available here. 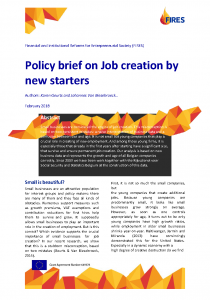 To foster job creation and economic growth in EU regions, policy makers are increasingly focused on the promotion of entrepreneurship and the creation of new economic activities. Analysing newly constructed pan-European datasets, we obtain a set of findings that show that both the degrees of relatedness and un-relatedness of existing portfolios of economic activities of regions influence new firm creation and new industry specialisations. In particular, entrepreneurship is fostered by related variety, whereas new industry specialisations are linked to both related and unrelated variety. 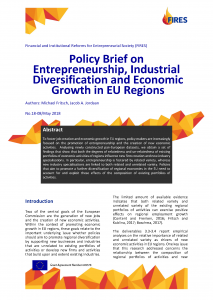 Policies that aim to promote a further diversification of regional economies in the EU need to account for and exploit these effects of the composition of existing portfolios of activities. 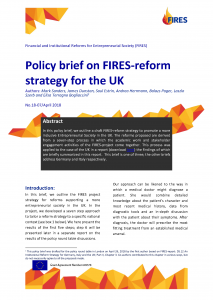 In this policy brief, we outline a draft FIRES-reform strategy to promote a more inclusive Entrepreneurial Society in the UK. The reforms proposed are derived from a seven-step process in which the academic work and stakeholder engagement activities of the FIRES-project come together. This process was applied to the case of the UK in a report (download here) the findings of which are briefly summarized in this report. This brief is one of three; the other briefs address Germany and Italy respectively. 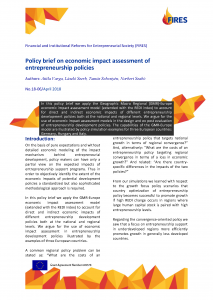 In this policy brief we apply the Geographic Macro Regional (GMR)-Europe economic impact assessment model (extended with the REDI index) to account for direct and indirect economic impacts of different entrepreneurship development policies both at the national and regional levels. We argue for the use of economic impact assessment models in the design and ex post evaluation of entrepreneurship development policies. The capabilities of the GMR-Europe model are illustrated by policy simulation examples for three European countries: Germany, Hungary and Italy. Since its initiation in 2008, the Global Entrepreneurship Index (GEI) research has addressed two important questions: (1) why an individual chooses to become an entrepreneur while others do not and (2) why entrepreneurial activities differ across countries. The GEI approach combines individual data with contextual institutional factors. We examine the performance of entrepreneurial ecosystem of 26 out of its 28 member countries of the European Union. 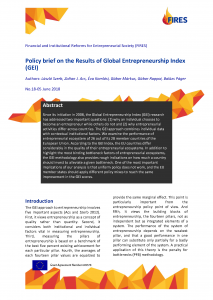 According to the GEI Index, the EU countries differ considerably in the quality of their entrepreneurial ecosystems. In addition to highlight the most binding bottleneck factors of entrepreneurial ecosystems, the GEI methodology also provides rough indications on how much a country should invest to alleviate a given bottleneck. One of the most important implications of our analysis is that uniform policy does not work, and the EU member states should apply different policy mixes to reach the same improvement in the GEI scores. 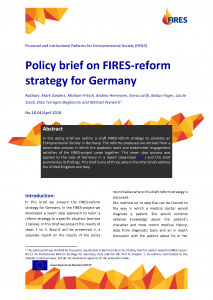 In this brief we present the FIRES-reform strategy for Germany. In the FIRES-project we developed a seven step approach to tailor a reform strategy to a specific situation (see box 1 below). In this brief we present the results of steps 1 to 5. Step 6 will be presented in a separate report on the results of the policy round tables where this draft reform strategy is discussed. In an open economy immigration is a natural process. It certainly poses challenges for the host countries, but it also brings benefits, especially if migrants are highly skilled. The mobility of “talented” migrants has significant impact on the innovation capabilities and economic growth of the host country. In contrast, the loss of highly skilled workers deprives their home countries of the scientists, entrepreneurs and other professionals who drive their economies to higher levels of efficiency and productivity. We show that knowledge and skills that move with the inventors have a positive impact on local innovation production as well as on entrepreneurship activity. The effect of ordinary migrant mobility on the latter is important too. 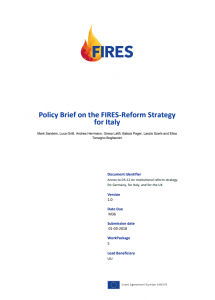 In this policy brief we outline a draft FIRES-reform strategy to promote an Entrepreneurial Society in Italy. The reforms proposed are derived from a seven-step process in which the academic work and stakeholder engagement activities of the FIRES-project come together. This seven step process was applied to the case of Italy in a report (download here) and this brief summarizes its findings. Italy was selected to be representative for a Mediterranean and so called mixed market economy. This brief is one of three, where the other briefs address the United Kingdom and Germany. Corporate Social Responsibility (CSR) is high on the policy agenda. Firms increasingly recognize the importance of taking a role in addressing the many challenges the world faces today. 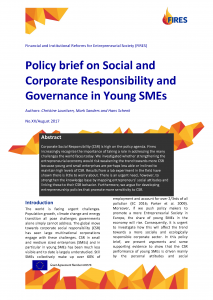 We investigated whether strengthening the entrepreneurial economy would risk weakening the trend towards more CSR because young and small enterprises are perhaps less able or inclined to maintain high levels of CSR. Results from a lab experiment in the field have shown there is little to worry about. There is an urgent need, however, to strengthen the knowledge base by mapping entrepreneurs’ social attitudes and linking these to their CSR behavior. 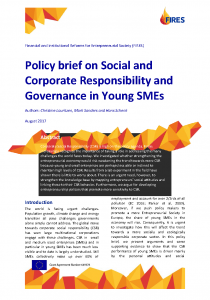 Furthermore, we argue for developing entrepreneurship policies that promote more sensitivity to CSR. 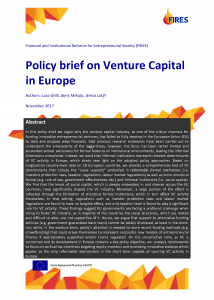 In this policy brief we argue why the venture capital industry, as one of the critical channels for funding innovative entrepreneurial ventures, has failed to fully develop in the European Union (EU) to date and propose ways forwards. Vast previous research endeavors have been carried out to understand the antecedents of the laggardness, however, the focus has been rather limited and accounted almost exclusively for formal features of institutional environments, leaving the informal dimensions unexplored. 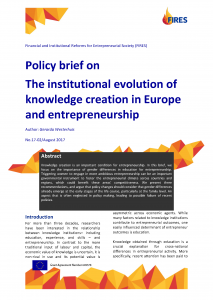 Instead, we posit that informal institutions represent relevant determinants of VC activity in Europe, which sheds new light on the adopted policy approaches. Based on longitudinal country-level data on 18 European countries, we provide a comprehensive test of VC determinants that include the “usual suspects” embodied in reformable formal institutions (i.e. investors protection laws, taxation regulations, labour market regulations) as well as more structural formal (e.g. rule of law, government effectiveness, etc.) and informal institutions (i.e. social capital). We find that the levels of social capital, which is deeply embedded in and diverse across the EU countries, have significantly shaped the VC industry. Moreover, a large portion of the effect is reflected through the formation of structural formal institutions, which in turn affect VC activity themselves. In that setting, regulations such as investor protection laws and labour market regulations are found to have no tangible effect, and only taxation level is found to play a significant role for VC activity. These findings suggest EU governments are facing a profound challenge when trying to foster VC industry, as in majority of the countries the social structures, which are rooted and difficult to alter, are not supportive of it. Hence, we argue that support to alternative funding vehicles (e.g. government guaranteed bank loans) cannot be totally dismissed, at least in the short-run; while, in the medium term, policy’s attention is needed to more recent funding methods (e.g. crowdfunding) that could prove themselves to represent successful new models of entrepreneurial finance if appropriately supported and/or (non-) regulated. On the constructive note, as VC is concerned and its development in Europe remains a key policy objective, our analysis recommends to focus on vertical tax incentives targeting equity investors and promising innovative startups which appear as the only reformable mechanisms in the short term capable of spurring VC activity in Europe. Knowledge creation is an important condition for entrepreneurship. In this brief, we focus on the importance of gender differences in education for entrepreneurship. Triggering women to engage in more ambitious entrepreneurship can be an important governmental instrument to foster the entrepreneurial climate across countries and regions, which could benefit these areas’ competitiveness. We present three recommendations, and argue that policy changes should consider that gender differences already emerge at the early stages of the life course, particularly at the family level. An aspect that is often neglected in policy making, leading to possible failure of recent policies. and knowledge spillovers, (viii) human capital investments, and (ix) informal institutions. 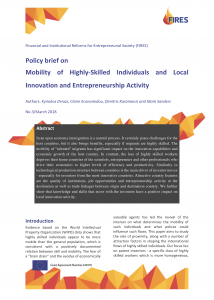 Labour mobility is an important condition for entrepreneurship. 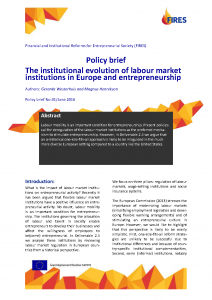 Present policies call for deregulation of the labour market institutions as the preferred mechanism to stimulate entrepreneurship. However, in Deliverable 2.5 we argue that an a-historical one-size-fits-all approach is likely to be misguided in the much more diverse European setting compared to a country like the United States.